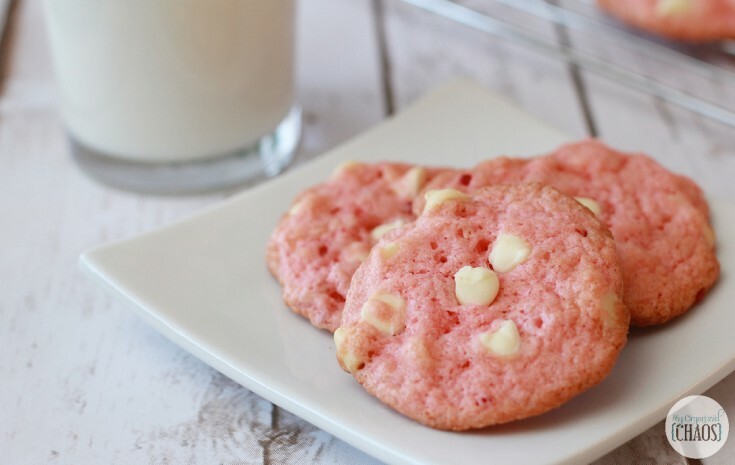 These delicious, soft and chewy cream cheese cookies with fresh strawberries and white chocolate chunks are tasty and make the perfect snack to satisfy those sweet tooth cravings! Preheat the oven to 350 F and line pans with parchment paper. Pour fresh lemon juice over chopped strawberries, drain them after a few minutes. Whisk together 1¼ cup all-purpose flour, salt and baking powder and set aside. Beat butter with sugar and cream cheese until it’s light and fluffy. Gradually add flour mixture and mix until it’s well combined. Stir in chopped white chocolate. Sprinkle strawberries with 1-2 tablespoon flour, toss them until all strawberries are coated with thin layer of flour and then stir them really gently in the batter. Drop heaping tablespoon of batter onto pan leaving an inch space between. Set the cookies in the refrigerator for 5-10 minutes before baking. Sprinkle the cookies with sanding sugar if you want, but do not overdo it because they are sweet enough. Bake for 13-15 minutes( until the edges become golden brown). Let them cool a few minutes in the pan than transfer them to a wire racks to cool completely.